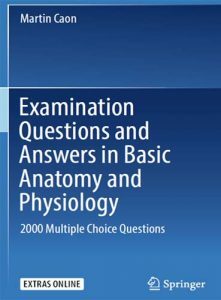 Two thousand multiple choice questions that could be asked of a student of introductory human anatomy and physiology are presented in 40 categories. It is assumed that users of these questions are teachers or students who have completed at least part of an anatomy and physiology course that might be offered in the fi rst year of a university degree programme. It is also assumed that they would have access to one of the anatomy and physiology textbooks (or similar) listed in the bibliography below. Each category has an Introduction containing a summary of useful knowledge pertinent to that category of question. However not all possible information is provided within these Introductions, so a textbook is indispensable. The summary Introductions are composed with vocabulary that may be unfamiliar to the beginning student but which should be known in order to understand the questions. You will need to look up the meaning of many unfamiliar words as your studies progress. All questions have been used at least once, during the author’s teaching career, in end of semester examinations of a university fi rst year undergraduate introductory anatomy and physiology course or a physical science course for health science students to support their anatomy and physiology study. Consequently they refl ect the author’s choice of content. Students enrolled in the courses for which these questions were written include nursing, midwifery, paramedic, physiotherapy, occupational therapy, nutrition and dietetics, health science students, exercise science students and students taking the course as an elective. Often, the students did not have an extensive background in science from their secondary schooling. Some knowledge of physical science is required to understand physiology; hence, physical science questions are included. Students without some background knowledge in chemistry and physics will fi nd such questions challenging and will need to work a little harder to develop their background knowledge. The boundary between chemistry and biochemistry is not distinct; nevertheless, chemistry is implicit in physiology.